The deals would give Ashgabat the option to sell gas to Armenia, Azerbaijan or even further afield. Turkmenistan is exploring options on natural gas swap deals with Iran to export its fuel to markets further afield, Iranian President Hassan Rouhani reportedly said during a visit to Ashgabat on March 27. Rouhani arrived in the Turkmen capital for a two-day visit that comes as something of a surprise given the current frosty state of relations between the neighboring nations. Speaking to the media after his encounter with President Gurbanguly Berdymukhamedov, the Iranian leader expressed satisfaction with their exchange. Semi-official Iranian media limited their reports to vague details about agreements on cooperation in economic and cultural affairs, but Russia’s RIA-Novosti news agency noted specifically that discussions had dwelled on energy issues. Rouhani was cited as saying that the two governments want to see an increase in gas swap transactions and a broadened use of pipeline infrastructure to export Turkmen gas to third countries. “Iran and Turkmenistan are very rich and powerful in the energy sphere, and so we agreed to undertake efforts to take our partnership in the sector to a higher level. We agreed in future to undertake wide-ranging talks on energy issues, and I trust that during our future encounters, we will conclude major agreements,” Rouhani said, without apparently offering details. Prior talk of such arrangements suggests Armenia and Azerbaijan would be the most likely recipients of Turkmen gas. With its economy in desperate shape, Turkmenistan has for some time been scrambling to find more buyers for its natural gas riches other than China. Despite that, Ashgabat has since January 2017 been embroiled in a messy row with Iran over claimed unpaid gas bills. In short, Turkmenistan claims Iran owes it around $1.5 billion for gas it delivered in previous years. Tehran has scoffed at the bill and insisted it wants to resolve the disagreement through international arbitration. Iran has also often played good cop with Turkmenistan, however. In November, Hamidreza Araqi, the managing director of National Iranian Gas Company, or NIGC, told Iran’s ISNA news agency said he hoped outstanding differences could be papered over through dialogue. “Iran still has time for taking legal action against Turkmenistan but any issue, in my opinion, can be settled in negotiations,” he said. In an another interview some days later, Araqi went further, suggesting that a gas swap deal could be considered. "We are averse to swapping Turkmen gas with Turkey and Iraq, but we have no problem with Azerbaijan and Armenia," Araqi told ISNA. This is not a novel arrangement. Just as the gas debt dispute was first raging last year, an NIGC official told media that Turkmenistan was still hoping to strike more swap deals to supply Azerbaijan and Armenia with up to 15 million cubic meters of gas daily via Iranian pipelines. “[Turkmenistan] is currently sending near 6 [million cubic meters] of its gas to Azerbaijan through Iran,” the NIGC official said last January. Adding a further geopolitical spin to this arrangement, a high-ranking Turkmen Foreign Ministry official has said that Ashgabat very much sees Armenia as a potential energy bridge to Europe. This all sounds like so much hyperbole, however, as even Armenian officials are obliged to point out that the gas pipeline linking their country to Iran can only carry 6 million cubic meters of gas daily. Iran also sells gas to Armenia, leaving limited room for Turkmen fuel. None of this, of course, translates into major financial returns for Turkmenistan. The primary benefits stand to be accrued by Iran, which looks to be painstakingly upgrading its strategic role as an energy and transportation hub. Turkmenistan may now begin to think about how to incrementally increase western-directed gas exports at Tehran’s pleasure. 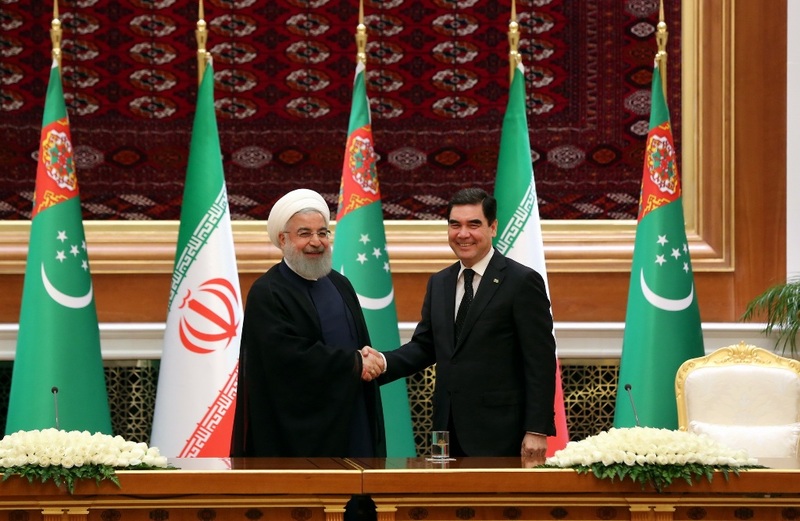 And while in Ashgabat, Rouhani and Berdymukhamedov also discussed options for the transit of electricity, a lynchpin component of Turkmenistan’s efforts to diversify away from gas exports. Railroads either completed or under development throughout the wider Central Asian space are ultimately intended to gain access to Persian Gulf ports. As hawkish elements in Washington with long-standing grievances against Iran secure their perch, Tehran is quietly working on fastening friendships among its neighbors.